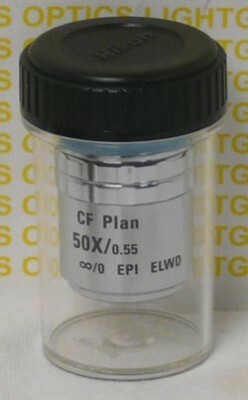 The Nikon CF Plan EPI ELWD 50X Objective is an Infinity-Corrected objective with a working distance of 8.70mm. It has a Physical Depth of Focus of 0.91mm, making it suitable for rough surfaces. The Numerical Aperture is 0.55, and is suitable for Nikons CF Series and well as the Optiphot 150, 200 and 300. 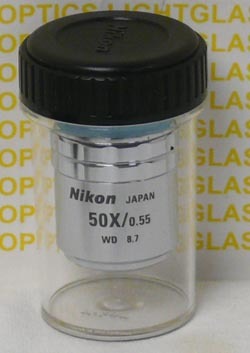 These are NEW in factory packaging, and I am selling them at 60% of Nikons price.